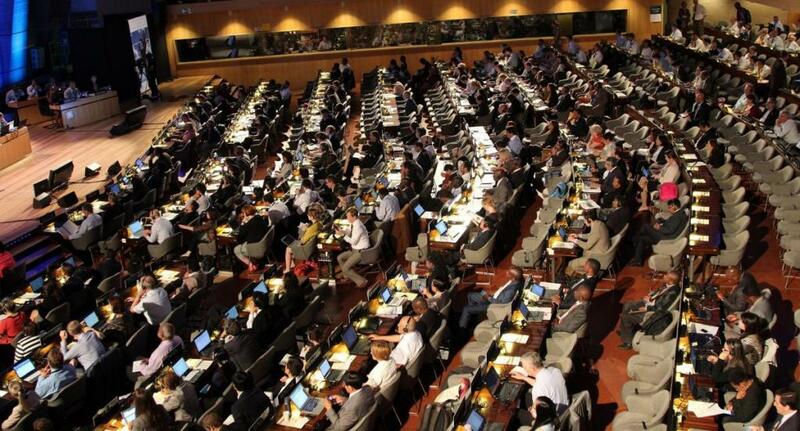 The twenty-seventh Meeting of the Parties to the Montreal Protocol on Substances that Deplete the Ozone Layer (MOP 25), began in Dubai on Sunday. The first day of the conference started with statements by a representative of the Government of the United Arab Emirates and the United Nations Environment Programme(UNEP), followed by the co-chair congratulating the parties for the progress made in the 36th Open-ended Working Group (OEWG) held last week. Followed by that, the agenda for the next five days was discussed in detail and a few countries raised objections and made suggestions for additional items, to the co-chair. “We are here not to tell a story but to write history,” said Micronesian delegate, stressing on the urgency needed to come to an understanding in phasing out Ozone Depleting Substances (ODS). The session also included discussion on critical-use exemptions by Methyl Bromide Technical Options Committee (MBTOC). Methyl Bromide or Bromomethane is readily photolysed in the atmosphere to release elemental bromine, which is far more destructive to stratospheric ozone than chlorine. Until its production and use was curtailed by the Montreal Protocol, it was widely applied as a soil sterilant, mainly for production of seed but also for some crops such as strawberries and almonds. Representative from Jordon, a country that has phased out Methyl Bromide, urged all other Parties to phase out as early as possible. South African representative said that they were having difficulty in using alternatives and so have applied for critical use and requested MBTOC to look into the permission as all the recommendations made were being implemented and to avoid negative impact and for food security. A presentation was made by the Technology and Economic Assessment Panel (TEAP), on the report that was published in June with updated results for projections, and costs were discussed in detail. There were comments from representatives of Kuwait and Saudi Arabia on how the graphs in the report did not give the complete picture and had questions on temperature usage in the graph. TEAP then explained how the model and graph was just an example and a starting point. It also suggested that not all the parameters like temperature zones, technology changes, costs for elimination of ODSs and stocking and collection of substances were considered. Canada, the US and the EU have said that the quality of the report has been increasing every year and that they were willing to work with TEAP to improve the accuracy of the predictions in the report. Saudi Arabia also highlighted how safety and energy efficiency that were the mandates of TEAP need to be given equal weightage and suggested that economical and social costs also need to be accounted for in cost estimates. Paraguay and some parties complained that they were having delay in disbursement of funds from implementation agency to the countries and that it could lead into a potential issue in future as the delay could lead to non compliance. The issue was noted by the chair and was suggested to be added in the report and the issue be raised with the executive committee in a separate meeting. Lastly, Samoa, Grenada and Cameroon have also stressed on the importance of ODS disposal and the need for MLF to fund the countries not capable of disposal. The contact group met for the first time with only one co-chair late evening. Discussions to have a co facilitator were happening late in the night and will mostly have one soon. The discussions in the contact group was very preliminary and on how the contact group might approach the work. It is expected that the discussions will be more productive in the next few days.